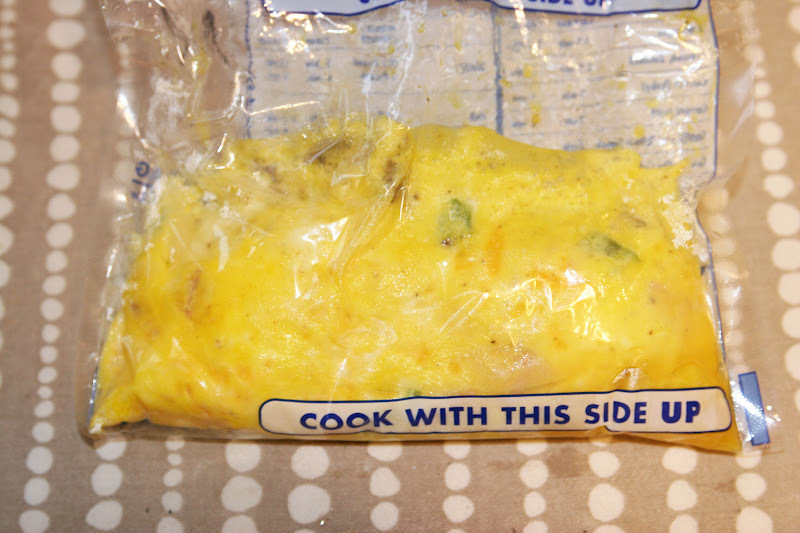 Have you ever tried making an omelet in a bag? I know it sounds crazy, but if you are camping or cooking for a crowd this is such a fun thing to do! We hosted a dinner with about 15 people over the weekend and decided to mix things up a bit. My family did this on Christmas day, and I thought it would be a fun and different way to cook for a crowd, so I tried it again and it was a success! 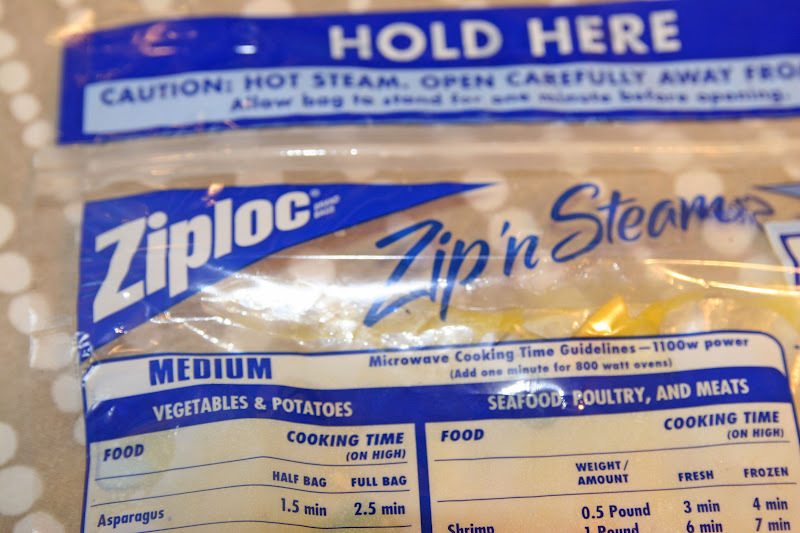 find some Ziplock zip ‘n steam bags. (no, Ziplock didn’t pay me to say any of this). You want to use these specific bags because they are made for heating up. I wouldn’t want to mess with conventional bags because it might not be safe to use at high temps. Set out some ingredients! 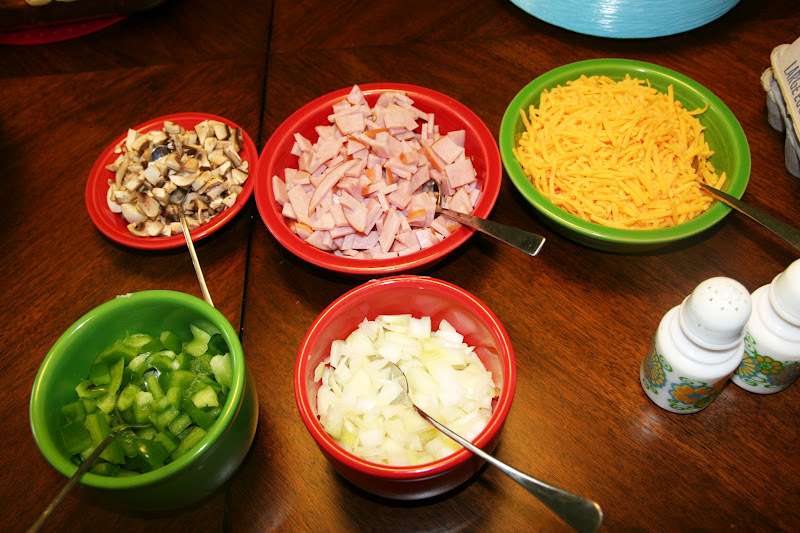 We did chopped onions, green peppers, mushrooms, cheddar cheese and diced ham. You could do spinach, bacon, sausage, salsa or any other yummy things that you prefer in your omelet! And don’t forget to set out the salt and pepper! Have everyone write their name on the bag with a sharpie. Then, crack 2 eggs in their bag and load up on ingredients. If you add too many toppings they take longer to cook. So, maybe just about 2 spoonfuls of each thing. Then, squish everything together. Put on the lid and set the timer for 13 minutes. You might want to add more minutes if you are doing 3 eggs or lots of toppings. But, for a normal size omelet, 13 minutes is perfect. And slide them onto a plate…and eat! Yum! I served it with fresh fruit and homemade cinnamon rolls. LIKE WHAT YOU SEE? FOLLOW ME ON FACEBOOK AND PINTEREST!! **UPDATE: Some people have commented about concerns of heating up plastic bags. I wanted to point out that I DON’T recommend using conventional freezer bags for this. I know that they may work the same, but they aren’t safe to use with food when being heated up. That being said, the zip ‘n steam bags are a better option. However, it’s probably not something you want to do daily. I personally don’t heat anything up in the microwave in plastic containers because they may or may not be emitting chemicals in my food. But, I thought these omelets in a bag were a fun idea to do once or twice a year when cooking for a large crowd and using safer plastic bags. They were sooo yummy and unbelievably easy. Now I think I want to try one with spinach, bacon and feta! Great idea Meg! I like this idea, but do you think you could cook it in the microwave? It would be quicker, right? And you would not have to use any pans at all. You could definitely try. I'd be worried about the eggs not cooking evenly. It's worth a try, though! Our family does this for breakfast when we're camping! We don't use the "Zip n'Steam" baggies, but it still works the same way. You do have to be careful not to let the regular baggies touch the sides of the pan or they will melt! I was thinking they would be great for camping, too! We're novice campers, so thanks for the tip you mentioned! Need a print friendly version. I've done this with "freezer" bags. Works just fine. I was able to entice my elderly mother-in-law to eat this omelet. She really enjoyed picking out her added ingredients. She had been very ill and got such a kick out of it! I know it works with the regular freezer bags, but I don't think they are safe to heat up. Just fyi! I like to make several of these and have thru out the week, I take out of bag and warm up when needed. I've used regular ziplock bags, I've always kind of rolled mine but your way looks much easier!!! It ia really important to NOT use regular plastic baggies, freezer or otherwise. These regular bags when heated produce a toxin (dioxin to be exact). Over time the dioxin builds up in your body and causes cancer. No joke, never heat anything in the microwave in tupperware or plastic wrap on it. I'm really glad the author of this recipe used a safer alternative. Jessi-I agree with you. I actually never heat things up in plastic. But since we used the special ziplocks and it's only for rare occasion when there is a big crowd of people to cook for, I thought it was a pretty fun idea. I definitely wouldn't do it every day even with the special zip 'n steam bags. Thanks for your comment. Very neat idea. Just want to comment here, because I don't want your readers freaking out needlessly. While I generally don't heat up plastic, it's not as bad as everyone thinks it is. First, while dioxins do cause cancer, plastics do NOT release dioxins (trust me, I'm a toxicologist). 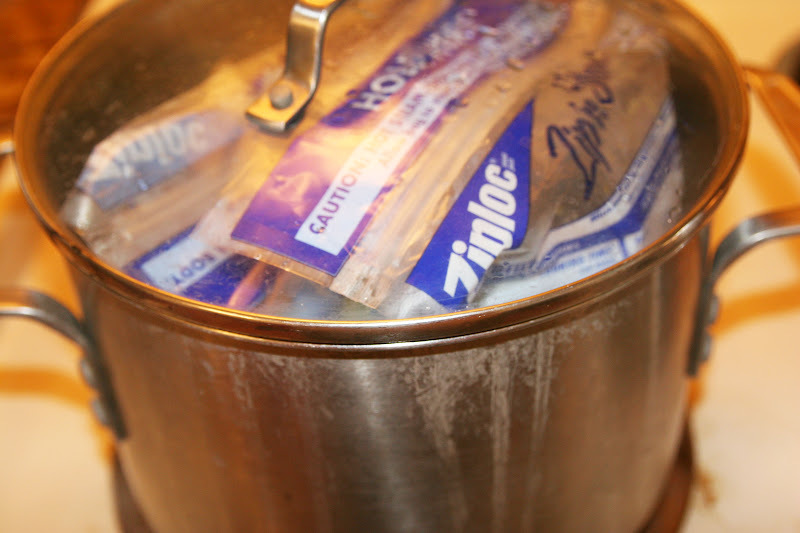 Secondly, softer plastics like ziploc bags don't contain as many chemicals as the harder ones… so this would be safe to do as long as the bag was thick enough to withstand the boil. So, cook on, girlfriend. Can you freeze alot of these in freezer?? What I have done is separate eggs (un-cracked) into the bags and added the other items (cheese, ham ect) and left them in the fridge for up to 4 days. My son will make these for himself when he gets up for school. He is 17 but not a wiz in the kitchen and he is good at these. We sue reg ziplock bags though. Our boy scout troup used to do this with regular ziplock baggies but were forced to stop the practice due to something like the plastic putting chemicals into the food as it heated. The boys were quite upset because it was always a hit. as I said before, I actually never heat things up in plastic due to those reasons of toxins being released into the food. That is why I specifically said to use the zip 'n steam bags instead of the regular bags, but it's probably still not something you should eat every day! Can't wait to try this with my kiddos. I haven't read all the comments, so I apologize if this was already mentioned… but hubby and I do this when we go camping. I take little containers full of shredded cheese, and cut up peppers, mushrooms, ham, pepperoni, etc…. most of which is used for fire pies for dinner, then the leftovers are used for breakfast the next morning! And to make things even easier, and a bit lighter, I'll buy the carton of egg whites instead of trying to lug a bunch of eggs out camping. I have a stockpot we only use for camping, and I just use a long pair of tongs to pull the bags out of the boiling water, then use the water to douse the campfire. We took eggs, the real deal, camping the 1st time we went (a few weeks ago) & never thought about the egg whites in the container. Great idea! this may be a dumb question. but do you turn off the heat after it gets to a boil for the 13 min? I was wondering the same thing because the directions say to put the lid on and usually the water will boil over if I do that. Are you sure the heat doesn’t need to be lowered once the lid goes on? It just depends on your stove top. Just do what normally works for you when you are boiling things! My neighbor told me they did this for camping and was an absolute "HIT" They shared bringing the ingredients. and everyone made theirs to their own liking, How can you go wrong! Easy prep, easy clean up and tastes good too!! I actually make these in the microwave. I mix all the ingredients in the appropiate bag the night before. I am running late getting the kids off to school so i just bring my bag to work and pop in the microwave. I fold the bag since it is laying on its side, to keep it in the shape of an omelet. how long did u cook it for? Hey, just wondering….. I use these bags for my veggies, but instead of having to boil it has anyone tried to microwave it? If you are worried about using plastic bags, or cannot find the appropriate kind of bag, smaller sized canning jars could be used. Then you have your omelet in a container that can be eaten out of as well. Great idea! I like the idea of this but wouldn't ever do it in plastic even the steam bags. Thank you for your suggestion. I've microwaved eggs in ramekins or custard cups. This would work well for this recipe. They come out very fluffy! has anyone made an omelet in a bag with egg whites?? if so how did it turn out? Hey guys! Food Saver bags are equally safe for cooking sous vide (from my quick online research anyway). Why I trust them more than Ziploc I don't know but they sure are great for camping! My friend Kathy brought this idea (and ingredients) to a girls' weekend in Carmel years ago. It was awesome! This is the only way I use when making omelets! I've been doing it for years, and am glad to say I'm still healthy as a horse. We have done these while camping for years, learned from some girl scout families. Never knew about the danger, sheesh! I wonder if you could use a mini loaf pan or like someone said, a custard dish in the microwave? Would be a cute way to serve it also. Michaels has some mini loaf pans that are smaller than most mini, would be a great size for an omelet. My husband likes all the vegi's saute'ed first so we would still have a dirty pan. Can you freeze these and then cook them when your on a pinch for time? Doing this for our next get together!!! can anyone tell me where i can get these bags? We were at a family reunion in Merrit BC and i got everyone to try this for breakfast.Who was in the kitchen boiling them….ME!! I had no choice but to use the zip lock bags. What about parchment paper bags and the oven?? We do these when we take a huge group on mission trips. We usually do a salad or potato bar one evening, we chop once – cook twice that way for preparing all the ingredients. Everyone loves fixing their own, and then enjoying it for breakfast. Another good thing, we keep the stockpot on the burner, and then as individuals arrive in the dining room, they pull their baggie out of the fridge and drop it in. That alows everyone to eat on their own schedule. Probably Seal a Meal bags would work well too. They are made for cooking. You could just fold them over and put a paperclip on top if you are on a camping trip and don't have the sealer. Also, there are silicone cooking bags availiable on line. They are much thicker put they are made for cooking too. You have to wash them out carefully afterward (they are reusable). They are food grade and safe for hot environments. I absolutely love this idea, this is just perfect for holidays and sleeping guests after parties! Yeah, such a genius idea! I have never seen these bags! Where did you find them? Looks interesting! Do you think it would work in canning jars? Can't wait to try this on our camping trip this week! The one thing I don't like about making omlettes (or even scrambled eggs) is that you can't have everyone's ready at the same time. I LOVE the idea that we can put them all in the same pot and sit down to eat TOGETHER! Noticed a couple of people asked if this would work if the bags were frozen first but received no answers. Has anyone tried this yet? It would be great when preparing meals for the ill or elderly. If using bacon, ham, or any other kind of meat for this recipe, should it be cooked or raw before boiling? Kids love to squish the eggs! 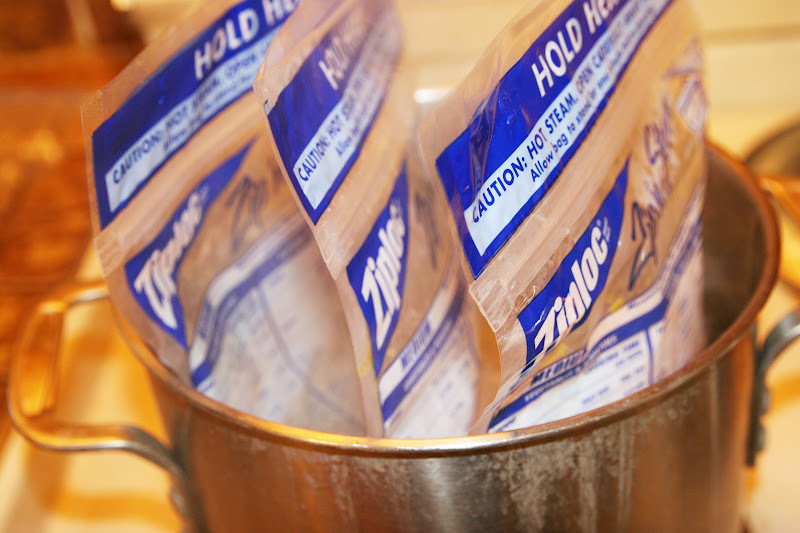 Have only used 1quart freezer bags. This is a huge hit when cooking for a crowd. I’ve never tried this in the microwave, so I’m not sure. I’m always a little hesitant to put plastics and baggies in the microwave for food safety reasons.